Located on Waitarere Beach Main Road. Our Escape is for all, surrounded by the local forest, great for families and couples to get away. A linear built house, with a renovated deck into a large open area, village shop's and park are within walking distance with a bottle store directly opposite the driveway. There is are board games for you to use, and a great backyard for kids to run around on or just for basking in the sun. The local campgrounds are very close by if you have friends or family holidaying also. On your way to the beach which is less than 10 minutes walk away, There is a little cafe and gift store right next to the Foursquare which by the way has the best Pies around! The beach has a fabulous restaurant at its entrance but if you're just feeling some good old fish and chips along with the restaurant there is another fish and chip shop about 150 metres from the bach doorstep. Levin is our closest town, a 10-minute drive away where there are many food joints to choose from as well as 3 supermarkets, The Warehouse, Farmers and many other shops where you will find everything you need. For families, there is also levins famous Adventure Playground which has a great coffee shop for the adults while the kids tire themselves out on the very large park playground before heading back to the beach house which keeps cool in the summer but heats very quickly from the fireplace during the cold season. Our little bach is perfect for your next quiet getaway with a loved one, family or friends with the capacity for up to 10 people. Everyone at the beach is absolutely lovely, welcoming and always willing to help or just stop for a chat! We LOVE Waitarere and know you will too. Great deck for the morning sun. The deck is fantastic for the morning sun, (all day actually). Makes the lounge and bedroom really warm. Nice views to the forest, nice and restful. Thanks so much, glad you enjoyed your stay. Come again. Great family escape close to all amenities. Cosy warm house with plenty of room. Love the huge deck. Will definitely come again for winter getaway. Thank you so much. My granddaughter even saw the real Easter bunny at gate !! Brilliant, we are glad you enjoyed your stay. Please come again. The house was clean and tidy and we found everything we needed. We enjoyed our stay at Waitarere Beach Escape. Having the deck to sit on was lovely on a sunny morning. We were expecting the beds to be made up but we found everything we needed to do the job ourselves. Loved having the table tennis. Time to stock up on new balls. We used the last one and accidentally stood on it...sorry. Thanks teresa and Kerry. Always live staying at your Bach. Thanks, guys, glad you enjoyed it, please come again. Excellent home away from home! AAA+ will be booking in the future! Quick and easy process from booking to check out! Owner Teresa was awesome! great communication throughout the whole process! House had everything listed right down to council rubbish bags for collection which made our stay easy! House was Nice and clean! Such a homely feel to it! We loved relaxing on the huge deck and the kids had fun on the pool table and huge backyard! Fantastic location down the rd from the beach and middle earth play ground! 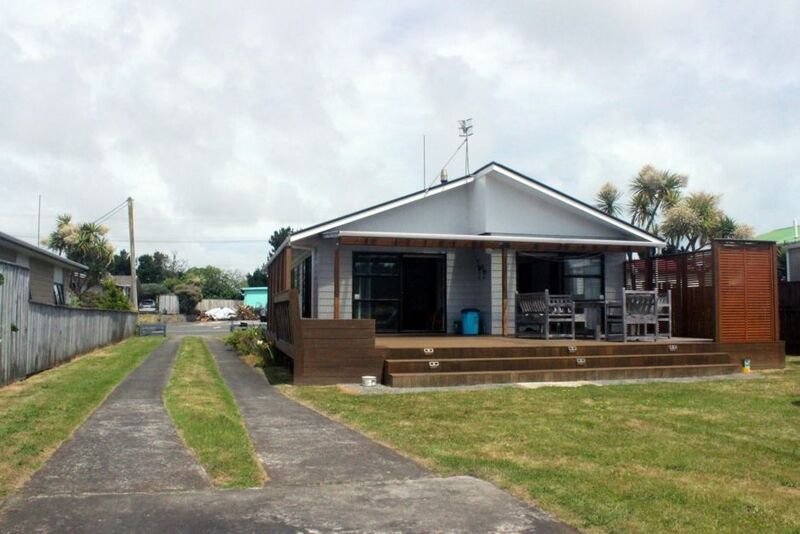 Family members had rented other homes in Waitarere Beach while we were there for a 21st celebration however for the price they paid they were not completely happy. I believe the price we paid for this house and what was available to use in the house was exceptional! We will definitely be booking this house when we return to Nz again! Thank you Teresa and Kerry! our aim was to make your stay worthwhile and I'm glad you enjoyed your stay we will look forward to your next visit, in the meantime, we will endeavour to improve the things we can to make it a lot more relaxing and inviting. thank you so much for visiting and your feedback much appreciated. Perfect place for a getaway! We were only there for a night but thoroughly enjoyed it, everything we needed and a short walk to the beach. Will definitely consider returning. Hi, glad you enjoyed it. Please come again.